Not into dairy? Lactose not your thing? No problem: you can still enjoy the rich, dark flavor of COOP's Hot Fudge with their delicious vegan version, made with coconut cream and coconut oil. Smooth and addictive, it gets rave reviews from vegans and non-vegans all over the country and was a 2015 sofi award finalist. 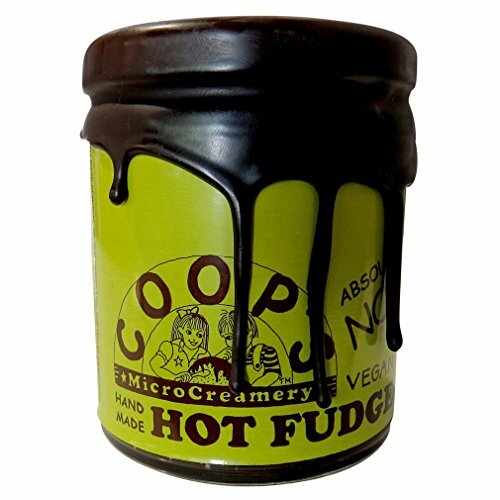 Coop's Vegan Hot Fudge is a handmade delicious treat made by Coop's MicroCreamery in Massachusetts. For 25 years Marc Cooper has dedicated his life to ice cream perfection. While serving up scoop after scoop of premium ice cream, he realized he needed a premium fudge sauce to match. And with this, Coop's Hot Fudge was born! No preservatives, corn syrup, or artificial ingredients.